I know Laura’s Modest Monday posts usually have a lovely picture of her in some cute outfit she has put together with 2nd hand & discount items. She does such a great job. With the holiday season descending upon us, I’d like to do something a bit different and concentrate on the boys of the family. I love to sew, but I readily admit to sewing a lot more for the girls than I do for the boys. It’s hard to come up with cute patterns and ideas that inspire me. Hand-me-downs and 2nd Hand stores don’t provide much variety in boy clothing. Boys wear things out quicker than girls. Plus, we live in Hicks-ville America where men and boys wear jeans or overalls to everything, even weddings and funerals. They figure, if they are clean and have on a western shirt and cowboy hat, well… what more could us girls want? Well, as a Mommy of boys, sometimes I’d like to dress them up a bit and show off my boys. Where does a mom go for ideas? Well, Pinterest of course! LOL. 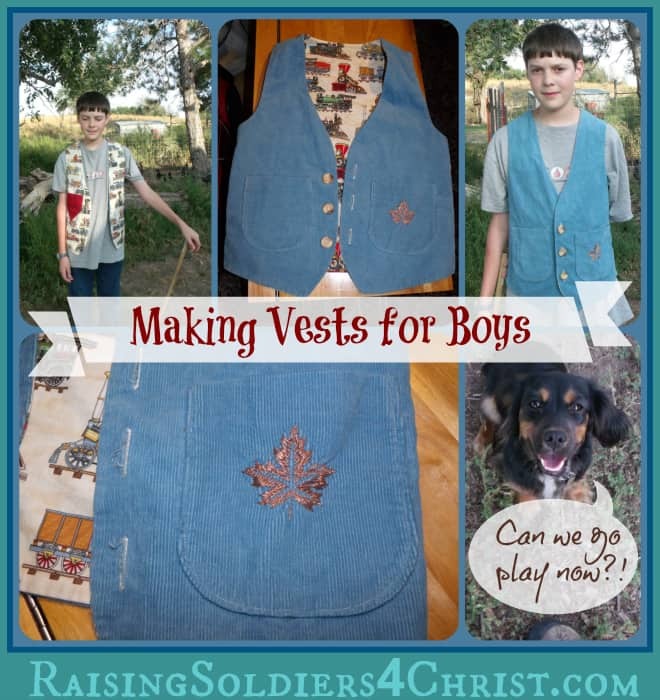 If you’d like, come visit my Sewing for Boys Pinterest board. The best way to dress up a boy without making up a whole new wardrobe is to make a nice vest. A nice vest can easily dress up a simple t-shirt and nice pair of jeans. It is fairly easy to find men’s suits at the consignment shop for very cheep. They are usually super nice quality fabrics and barely worn. I love re-purposing clothing. It makes me feel frugal and accomplished. Here are a couple of tutorials I found online. Even if you don’t sew, I think you could figure these out and make something fun. If this is new to you, use some fun fabric in a cotton boy print first. Or a plain fabric to sew patches on. If it doesn’t look perfect (mine never do) at least they will have a blast playing in it. This will give you a feel for what you are doing. A great tutorial for re-purposing adult clothes. 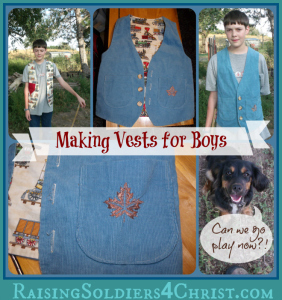 Make-it & Love-it has a very detailed tutorial using a t-shirt as a pattern Re-purposing: Reversible Boy’s Vest from Old Trousers. Sewing in No Man’s Land made an adorable Vest & Newsboy Hat out of a skirt. Shwin & Shwin’s “Vest” of friends (the boy vest), she has a coordinating girl vest tutorial too. I happened to have a TON of corduroy in my stash that I have picked up on sale through the years, so that’s what I used. I decided to line this on in a fun fabric and make it reversible. Our oldest boy has always loved trains. I happen to have an embroidery machine, so I embroidered a leaf in copper metallic thread on the blue pocket to give it some interest. Perfect for Thanksgiving! There are so many fun fabrics that could be used; brown for Hobbit vest, tan for Jedi, green for tractor or turtle dudes… Lots of fun ideas for dressing up the boys of the family! Enjoy! Dawnita Fogleman is a fifth generation Oklahoma Panhandle Pioneer. She and her husband, Paul, have six amazing children. They have homeschooled from the start and now have two graduated and starting their own businesses. With the family business and their little farm, every day is a surprise. Dawnita blogs about life on the “funny farm” at FoglemanForerunner.com.